Before iOS 7, iPhone and iPad users could share posts on Facebook and Twitter directly from the Notification Center. This would also enable users to post to Facebook with the “via iOS” tag. But ever since iOS 7, Tap to Post and Tap to Tweet has been removed from the Notification Center. And the official Facebook app for iOS doesn’t allow users to post with “via iOS” tag. Even so, there are still some workarounds that let you post “via iOS” from your iPhone, iPad or iPod Touch. In this article, we’ll list down a few of these workarounds. Even though the official widgets for Facebook and Twitter are no longer available in the iOS Notification Center, these services are still integrated within the OS (iOS 7, iOS 8). Whenever you share a photo from the Photos app via the Share menu, the post is shared as “via iOS” on Facebook. 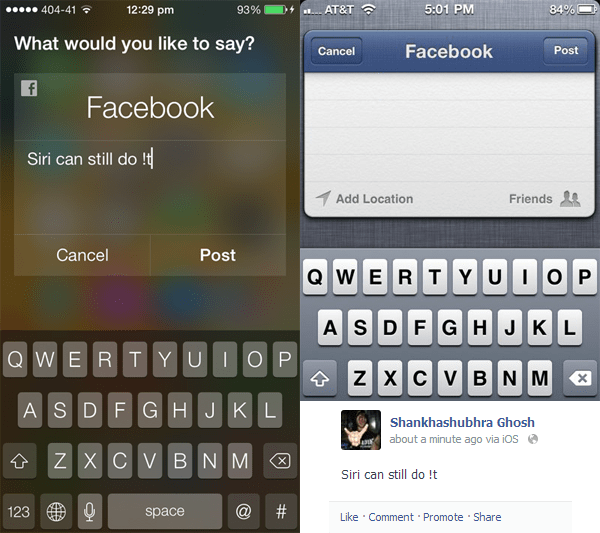 Similarly, Siri can also help you to post updates on Facebook with “via iOS” tag. Note: To integrate Facebook and Twitter, you need to log in to these services from within the Settings app. Open the Photos app and select a photo that you want to share. Tap on the Share icon at the bottom left corner of the screen. From the Share menu that appears, tap on Facebook or Twitter depending on the platform in which you wish to share the photo. A popup appears with your photo ready to be shared. Here, you can also control the privacy of your post, share your current location or add a suitable caption for the photo. When you are done, just hit the Post button to publish it on Facebook or Twitter with “via iOS” tag. Open Siri by double-tapping the Home button. Say “Post to Facebook” or something similar, to share a status update on Facebook. If you want to tweet, say something like “Post to Twitter“. A pop up will ask you to put your status update. You may directly type into the input box or dictate the words to Siri. When you are done, just hit the Post button and your update will be published with the “via iOS” tag. It might not be suitable to ask Siri every time you want to update your status on Facebook or Twitter. Also, if your iOS device does not support Siri (like the iPhone 4), the above method is not feasible for you. There are some third party apps that prove to be handy in such situations. iPost 7 is an iOS app that lets you to directly post to Facebook or Twitter at the tap of a button. Shared posts from the app are tagged with “via iOS” on Facebook. The free version of iPost 7 provides free access to Tap to Post and Tap to Tweet options. To unlock more options, you need to upgrade to the paid version of the app. The following steps will guide you to post via iOS using iPost 7. Download and install iPost 7 from the App Store. Open the app and select “Tweet to Twitter” or “Post to Facebook” from the list of available options. A popup appears for you to type your update. Here, you can also control the privacy of your post, share your current location, etc. When you are done, just hit the Post button to publish it on Facebook or Twitter. Postr is another app similar to iPost 7, which lets you to share a status update on Facebook (with “via iOS”) or Twitter. TapToShare is another iOS app that allows you to share your posts to Facebook with “via iOS” tag. In addition to Facebook, the app allows you to share posts through Twitter, Messages, Email, WhatsApp, Line and Telegram, and support for more apps could be added in future releases. The app includes a Notification Center widget where you can place up to 4 shortcuts to tap and share directly from Notification Center. Launch TapToShare app on your iOS device. Tap on the Gear icon (Settings) at the top right corner of the screen. Tap on Widgets and toggle on the apps you want to enable in Notification Center. If you want to have some fun with friends and family, an app called FB PostVia allows you to publish updates on Facebook with funny and abstract via-tags. You’ll also be able to post updates with device specific via-tags (for e.g., “via iPhone, “via Macbook Pro”, “via BlackBerry”, “via Nokia Lumia”, etc.). Since it doesn’t use the native Share widget, you need to separately log in on Facebook within the app. Most of the via-tag options were working when we tested, although there were some that displayed error message. If you come across any other third party app that can share status updates “via iOS” on Facebook, Twitter or other social websites, do let us know in the comments below.